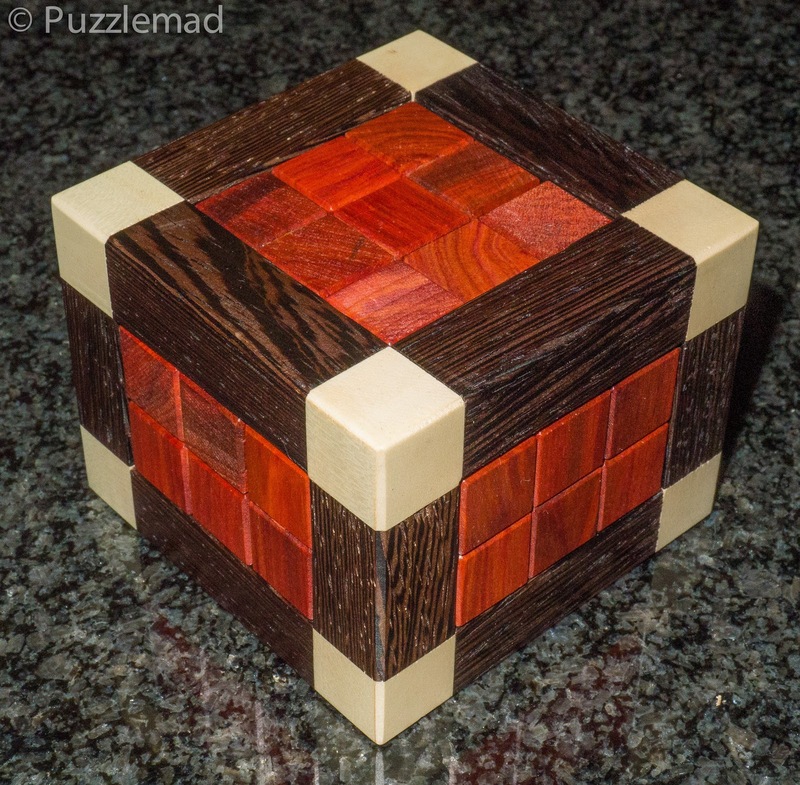 PuzzleMad: How complex can a packing puzzle be? It's "Odd" how you can be good at some puzzles and bad at other similar ones! The train of thought for this blog post was started by my really good friend Dave Holt (the Master puzzler in charge of The Metagrobologist on line magazine) when he posted on his Facebook page a few days ago of a picture of the Odd puzzle by Iwahiro as an example of a puzzle that he likes to give to non-puzzlers to provide a nice fun challenge. 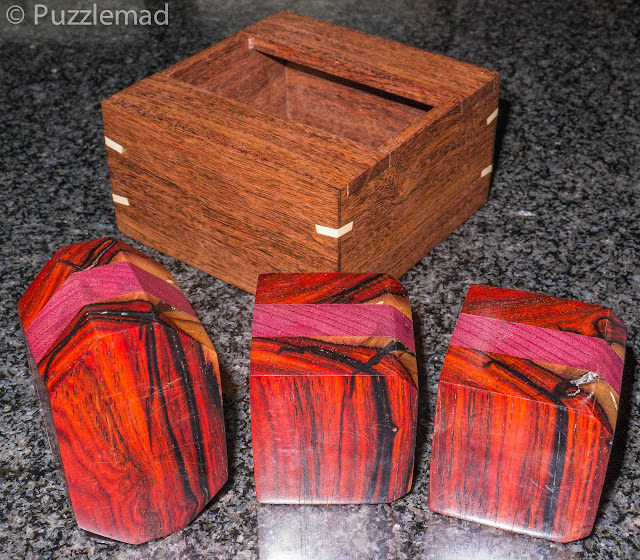 My version above is one of the most beautiful puzzles I own and was made for me by my friend Neil from Cocobolo and Purpleheart with a box made with Katalox and Holly slipfeathers. 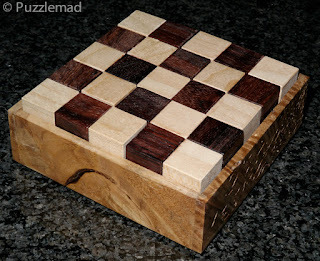 This got me thinking whether packing puzzles were always the best thing to give non-puzzlers? So I have looked back at my collection and some of my recent acquisitions to review my thoughts on this genre and what made me buy them. Hmm! That seems to be quite a few exceptions to my rule of never adding packing puzzles to my collection. But, compared to burrs and wire things, my packing puzzle collection is quite small. A large proportion of my packing puzzles are variants of the 'omino puzzle - they may be tetromino, pentomino, hexomino, or a combination. 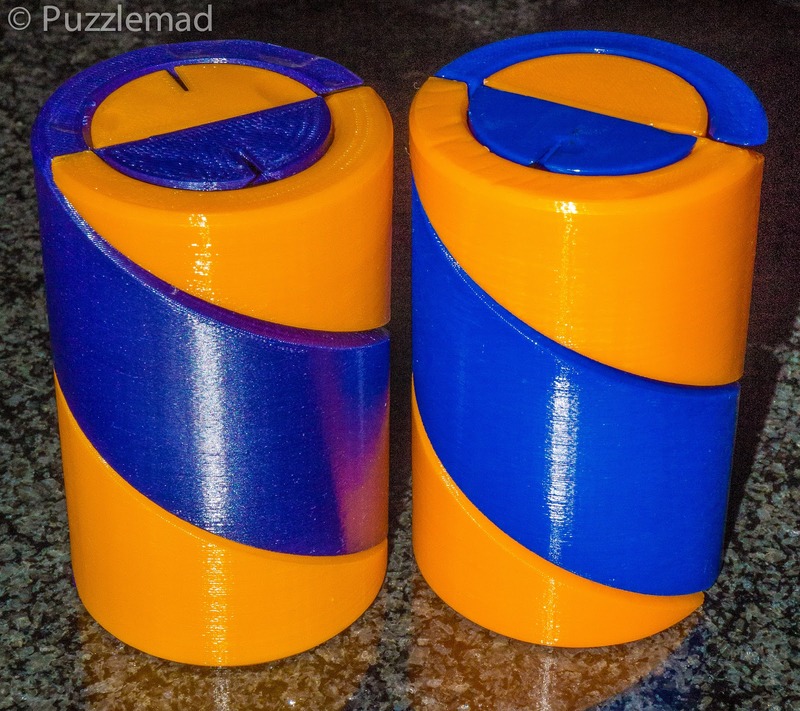 To add interest and complexity they may have a colour scheme or pattern and if you are a real sucker for punishment they can be 3D or as an ultimate have an odd 3D container to pack them into. This puzzle makes it into the collection because of criterion number 1. 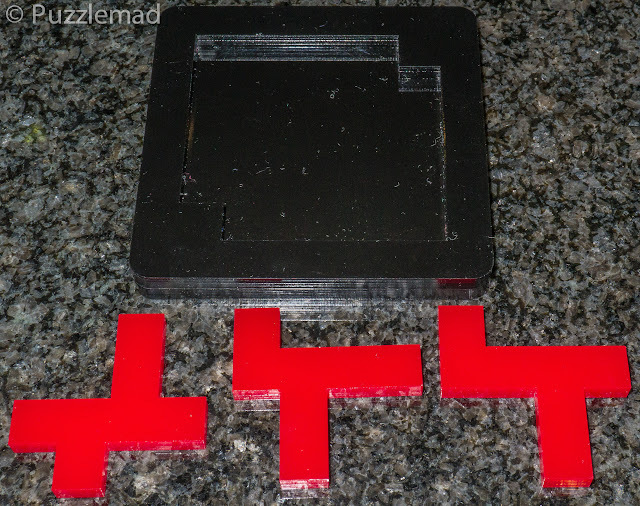 At the last IPP in Ottawa my friend Jerry who writes a fabulous blog participated in the Edward Hordern puzzle exchange and gave away one of his own designs, a nicely made packing puzzle called CamelPak made from laser cut acrylic. At the IPP he gave a copy for me to Big Steve (that's Mrs S' name for him because he towers over me) and on returning to the UK, Steve promptly forgot about it! Some months later, when I bought the next 2 designs in Derek's helical mind-bending challenge from Steve he suddenly remembered my gift from Jerry and it was a nice unexpected bonus in the box. Thanks Jerry for the lovely gift and Steve for remembering and being so nice to me in general! I played with the CamelPak one evening whilst watching the TV with Mrs S and the cats. She was delighted when it turned out to be less noisy than some of my recent toys and Zachary on my lap was also delighted that it was less heavy, less pointy than others and that I didn't keep dropping bits on him. The instructions on the back are: 1st challenge - pack all the 5 camels into the tray. 2nd challenge - pack 4 camels, the dog and snake into the tray. 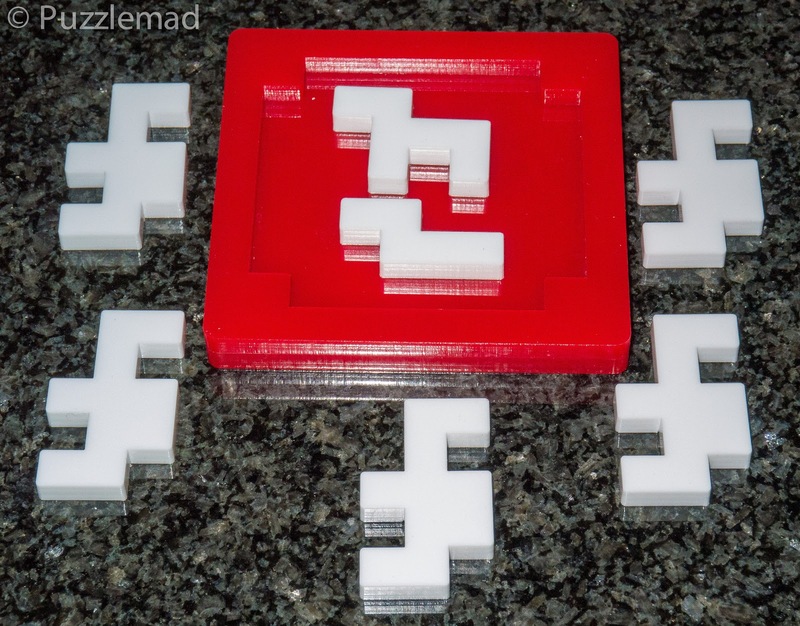 Now this has 5 deca-ominos, a heptomino and a pentomino. I usually find that the higher the number in the 'omino the tougher the puzzle but, in retrospect, I guess it should also depend on the size and shape of the tray. I played with this during an episode of "The Strain" and by the end of it, I had solved both challenges. Mrs S only gave me one dirty look when I shouted "Yessss!" after the second challenge and I am pleased to say that this is a really nice fun little challenge - it is absolutely perfect for an exchange puzzle. This is one that I now bring to work to torture people with along with his exchange from last year. I don't actually appear to have written about Jerry's exchange puzzle from the previous year, Triple play, designed by the incredible Goh Pit Khiam. Let me remedy that now! It is also a packing puzzle but with 3 heptominoes and was a lovely gift from Jerry. With only 3 pieces (even being 7 units in size) and a decent sized tray, I figured that it should not be too tough. WRONG! This one meets criterion number 2 - there is something extra to it. I tried for quite a while to pack the pieces with no success until I had a little brainwave.... maybe there is something extra to it? Maybe the pieces don't get placed orthogonally? Once I realised this then it took me another hour or so to find the solution - surprisingly tough! This one is also kept with me at work to torture colleagues - especially when they are so smug after solving CamelPak. 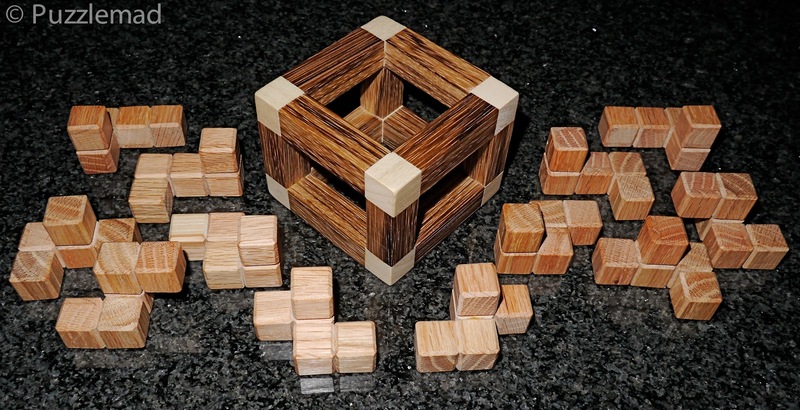 Now I am sure you are thinking that if being non-orthogonal is a reason for me to buy, then I am not really limiting myself very much and quite a lot of Stewart Coffin's tray packing puzzles meet this criterion. Let me just answer with a huge grin and say "why would I want to limit my collection too much?" Another fairly recent acquisition which has kept me busy for a while got into my collection on account of exception number 3 - it was a very reasonable price and has a huge amount of puzzling for that small price. This one was shown on Facebook by the Felix puzzle company and when I saw the "puzzling for the money", I just had to have it. It consists of 12 different pentominoes and a variable sized tray. It comes with a booklet that has so many challenges in it that it has to be split into chapters organising them by level. There are 485 different challenges which will probably keep me going until the end of my life! I certainly would not recommend anyone going through the whole lot in sequence but it is a fun thing to do on a rainy Sunday afternoon to while away some relaxation time. It is also absolutely perfect for children. So far I have only done about 20 of them but I do keep going back to them. Now all of the above puzzles would be perfect to be handed to non-puzzlers and would keep them interested and having fun for a fair amount of time but after that, I wonder whether my others might be too specialised (or tough) for the normal human being? My real problem with packing puzzles came when I bought the Unhappy Childhood puzzle. 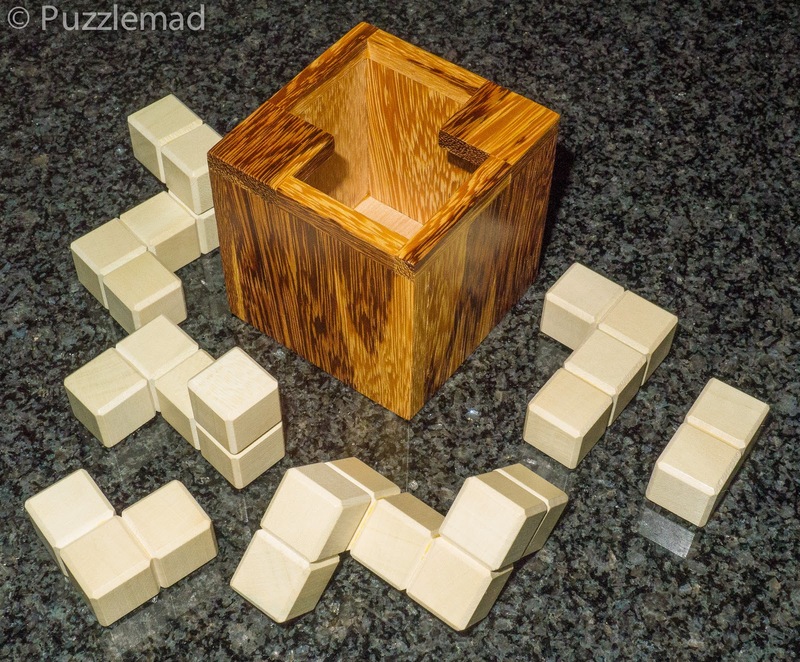 It is "just a pentomino packing puzzle with 10 pieces to fit in the tray and it meets criterion 1, 2 & 4 being made by Neil again, with the "extra something" being that it is 3D and also has a chequerboard pattern requirement and as you can see is absolutely stunningly gorgeous! I have tried to solve it on and off for a few years and have NEVER managed it! But it remains on display amongst the most beautiful of my toys. 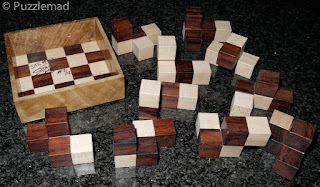 Certainly NOT suitable for a beginner or non-puzzler! 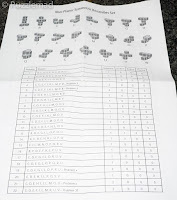 A few weeks ago, I described the L-I-Vator puzzle which I finally solved - this is another 'omino puzzle (from domino up to heptomino) packing puzzle which enters my collection because it meets 3 of the criteria - it has extra somethings - rotational moves which always makes this sort of thing tougher, 3 dimensional geometry and it is also an interlocking solid type puzzle. Plus of course, it was made by Brian Menold (whom I now consider a friend after all these years of communication and chat). Finally, being made out of Holly and Marblewood it is truly beautiful (criterion number 4)! It is odd that this one is more complex in idea than the Unhappy Childhood (with 2 types of puzzling and rotations) but it is very much suitable for beginners and very enjoyable too. I gave it to a medical student an he solved it in about half an hour. Finally in my 'omino series is the the Framed non-planar symmetric hexacubes designed by Primitivo Familiar Ramos and also beautifully made by Brian Menold. It makes my list because it meets all 4 criteria! provide a lot of puzzling for the price - there are up to 148 possible challenges here! it is not just beautiful - it is gorgeous! Made from Holly, Wenge and Redheart. This was an entrant into the IPP design competition this year and when Brian posted that he had permission to make a few versions of it, I jumped at the chance. Several different sets were going to be available - either a basic simple set with multiple wood types or (and how could I resist?) a complete set of hexacubes with the frame. 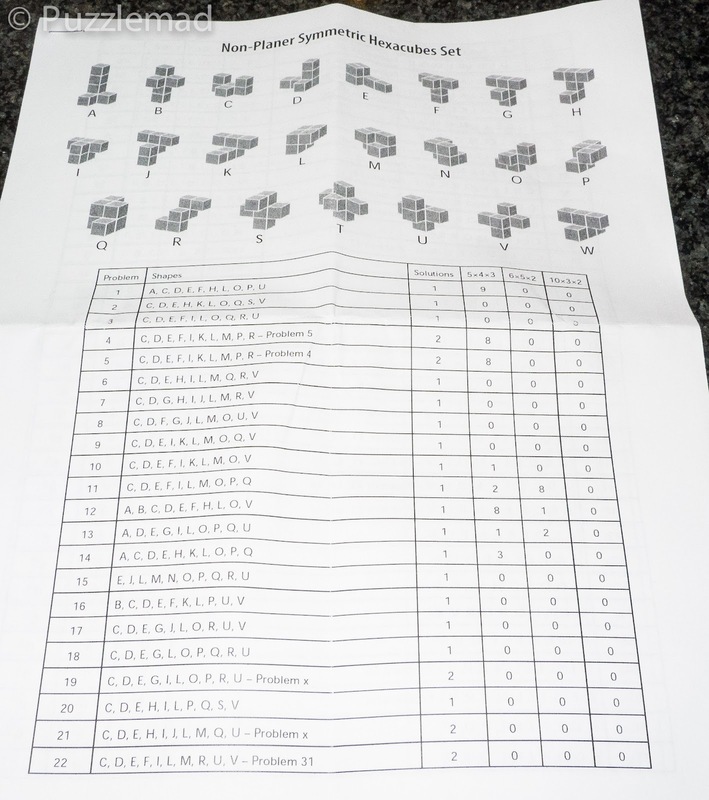 The selection of hexacubes has been limited by the stipulation that they are all symmetrical and it comes with a list of possible challenges. First select a set of pieces and place them inside the frame - how hard can it be? 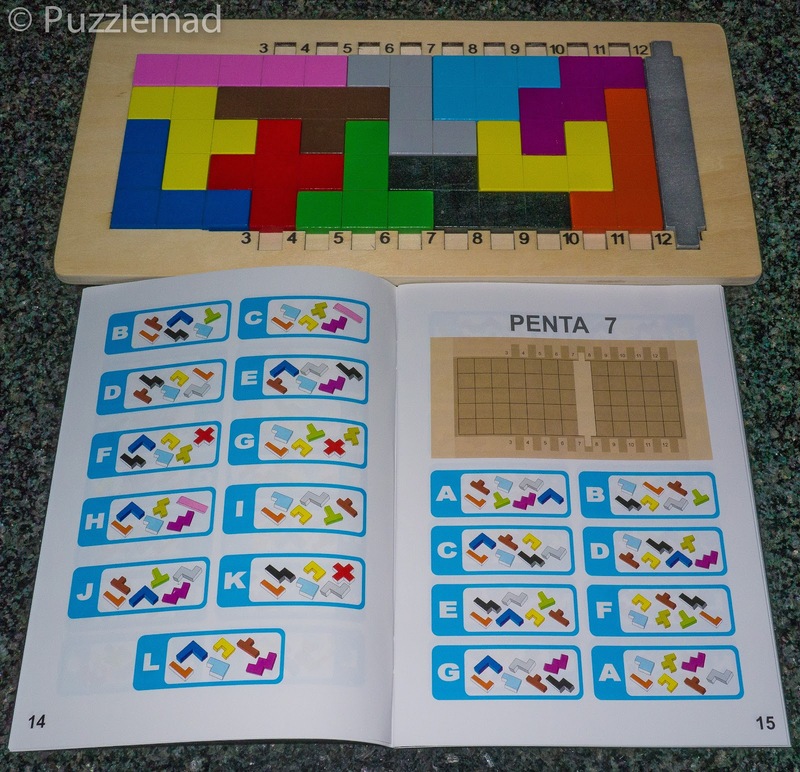 If you actually do complete the entire series then there are additional challenges on the sheet - make a 5x4x3 or a 6x5x2 cuboid from various combinations of pieces. OMG!! This puzzle is so tough that I have had to resort to using Burrtools just to put it away for storage! I have tried repeatedly to solve this, trying many challenges from the list that Brian gave me but have failed every time. It is not one that I can easily play on an evening with a cat on my lap as it needs me to spread out on a table. There is something wonderful about playing with this - the wood has a warmth to it and it is beautifully made. I have tried forming the end cross shape outside the frame a few times and can usually manage that but when it comes to assembling it inside the frame, it becomes, to me, an almost impossible challenge. I love it - and, much to the chagrin of the first wife, it has found a place in my living room display rather than being confined to the study. 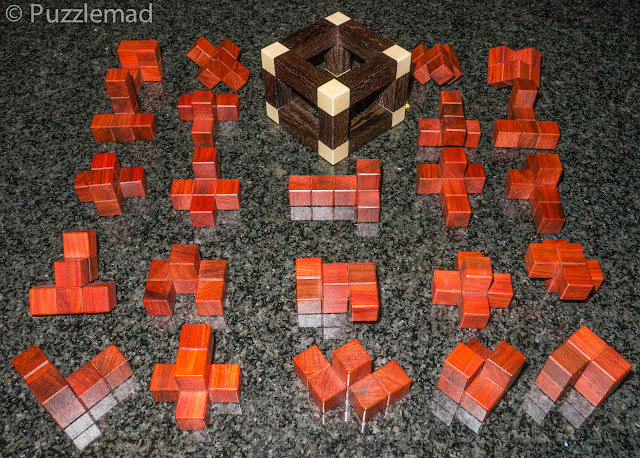 I should probably have realised how difficult this would be when I also failed to solve the earlier puzzle - the Twin pentominoes in a Lightbox from the same designer/craftsman combination. The current one is hexominoes and with much more complex pieces as a result. I didn't stand a chance! However beautiful and interesting these might be, they are definitely not suitable for a beginner. So far, I have not yet worked out what makes a packing puzzle of interest to a non-puzzler. All I know is what 4 criteria make it suitable for me! If you have any thoughts then leave a comment below. Over the next few weeks, watch out for some very special updates from me - those dastardly puzzle craftsmen have all conspired to relieve me of my pay cheque all at the same time! Packing puzzles have a kind of 'I see what I need to do' appeal. 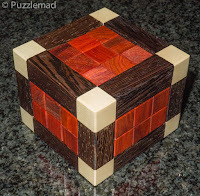 Like a disentanglement puzzle or a puzzle box people can usually see immediately what they need to to, but unlike disentanglements and puzzle boxes when they do reach a solution they will usually have an 'ahhhhh I solved it!' feeling rather than a 'what just happened?' feeling, which can be the case for the uninitiated with the other two types I mentioned! Then again, this appeal usually only applies to simple packing puzzles... I think hard packing puzzles have the one of the biggest frustration factors. Hi William, I think you summed it up perfectly! The frustration factor is huge for me with the really complex packing puzzles and hence my limitations on those that I will buy! I definitely have plenty of "how did I do that moments" with disentanglements. Keep at it! It's not too hard. Definitely a fun one suitable for everyone! OMG I Iove your blog! I found it when I searched internet for Hanayama reviews and I want to thank you for your post and linking puzzlemaster. I've been looking for the hardest puzzle possible. I've just purchased puzzles as Christmas present for my husband. It's really hard to buy a excellent present (something that brings joy and excitment) for him and you just solved this problem for a couple of years. Now I know there are brands of intresting puzzles that are inaccessible in my country. Once again, thank you. You just save Christmas for me! Well it's my pleasure! I am glad that you find what I write interesting and helpful! I try to review a mixture of puzzles that are available to all puzzler's with varying wallet sizes - it's nice to know that I am doing something right.